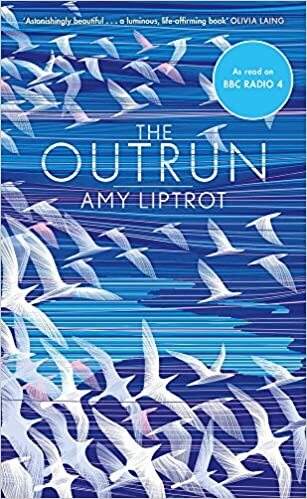 In June I had the pleasure of going to the Hay Festival, where I went to hear Amy Liptrot talk about her memoir. I finally got around to reading it during the last fortnight. This memoir is about her survival from alcoholism in London to sobriety in Orkney, and how, by immersing herself fully into the harshness and beauty of nature in her homeland, she learnt to heal and live again, revitalized and renewed. Amy Liptrot was brought up in the Orkney Islands, north of Scotland. She grew up on a farm on the edge of a wide area of land known as the Outrun, that led to the cliffs above the Atlantic Ocean. Her family life was not serene. Her father suffered from Bi- Polar disorder and her mother joined an evangelical religious group. Despite her love of the wild nature around her as a child, Amy Liptrot yearned to experience city life, and she sought to escape Orkney at the first available opportunity. After studying in Edinburgh, she moved to London looking for excitement and a more glamorous life. What began as drinking at parties and on nights out, soon spiralled into habitual drinking and then heavy drinking, and before long Amy was in the depths of alcoholism. Initially she managed to hold down jobs, but eventually her drinking became out of control, and following a devastating break-up (due to her drinking), she booked herself into rehab. Following her time in rehab she found herself unexpectedly drawn back home to the Orkney islands. Liptrot writes so eloquently, both about her struggles with alcohol, (about which she is brutally honest) and her love and knowledge of her beloved Orkney. A mixture of nature writing and self-reflection gives this memoir a unique twist. The author’s knowledge of nature and the wild life on the islands of Orkney is impressive, and I found the excerpts on the seabirds and animal life in the small Scottish islands fascinating and evocative. The weather is brutal in this part of the world and yet for the author it is not experienced as such, but instead is exhilarating and energizing. A new healthier drug. Her journey to sobriety is a daily struggle, but with the help of friends, family and a new focus, she gains strength from the beauty of nature around her. Liptrot’s honesty gives this memoir a searing authenticity, and for anyone who has ever struggled with any kind of addiction, I am sure they found much with which they could identify. Her nature writing is elegant, and the harshness of nature is reflected in her own struggle with herself. She cannot beat it; she has to accept it. This memoir has just won The Wainwright Golden Beer Prize, a prize for nature and travel writing in the UK. I am delighted for her, as I think she is not only a beautiful writer, but a courageous and worthy winner. I highly recommend this memoir.